In my humble opinion, the NHL of the 1980s and 1990s was the best time to be a fan of the league. Little to no sponsorships, endorsement deals were few and far between, no insane physical testing and if you could throw a few punches while balancing on skates well, you had yourself a job. The fighter, goon, or tough guy if you will is long gone from today’s NHL. Yes of course there are still fights but if you don’t know how to use your stick and score more than a few goals, say goodbye to the big leagues and welcome to the LNAH. (Unless you’re John Scott apparently but he’s a whole separate post waiting to be written.) With the additions of European and Russian players into the league, emphasis was brought upon speed and skill. Combined with the rough and tumble, hard-hitting North American style, we have the league that we see now. Without going into the obvious choices for the best of the best, like Bob Probert and company, the players I’m listing here may not be house hold goon names. A lot of my readers are hockey fans from the United Kingdom who are relatively new fans of the game. I figured I would give you all a look at some of the lesser known fighters that I grew up with. Growing up I was an avid hockey card collector. Along with my infamous collection I would pick up old VHS hockey blooper and hockey fight tapes from yard sales and flea markets throughout the area. I used to watch these over and over. I’d have a sick day from school and I’d spend hours watching them with my Uncle who would babysit me. We’d have a blast. So without further ado, here’s part one of a list of NHL enforcers (in no particular order) from my eyes. Kordic was insane. He obviously knew how to throw a few punches but he also knew how to take them mostly to being coked out of his mind every game. His drug and alcohol problems were well documented and after a short seven year career, Kordic overdosed and died at the age of lucky number 27. Along with fellow enforcer Chris Nilan, Kordic was a part of the 1986 Stanley Cup champions; the Montreal Canadiens. He is also famous for being in an epic trade that sent him to the Toronto Maple Leafs in exchange for Russ Courtnall. Some of his more famous fights are with other players on this list. At 6’2, 210 pounds, Miller was drafted by the Quebec Nordiques in 1990. The feisty American left winger was eventually picked up by the Boston Bruins and split his career between them and the Los Angeles Kings. After 8 years, Miller amassed 1723 penalty minutes in only 446 games. 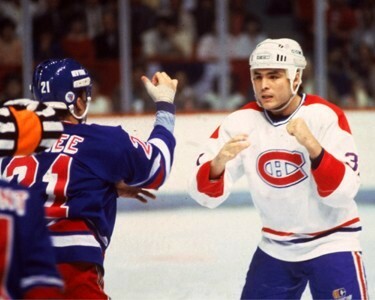 Most of his fights included the aforementioned John Kordic which added more fuel to the ever growing rivalry between the Canadiens and the Bruins. The Minnesota North Stars were trying to find their bearings through most of the 1980s and held one of the best two punch fighting tandem in McRae and Churla. McRae spent the bulk of his career in Minnesota earning himself 2457 penalty minutes through 16 seasons. 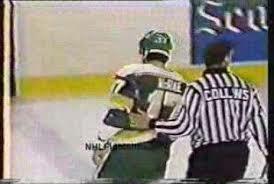 Another one of Kordic’s infamous oppenents, McRae is now part owner of the Ontario Hockey League’s London Knights. Churla managed to notch 2301 penalty minutes throughout his career with Minnesota/Dallas, Los Angeles and then to the New York Rangers. Another big lad at 6’1 and 200 pounds, Churla provided the muscle and protection for the star players on the teams he played for. Pavel Bure took him down a notch with a vicious elbow during the 1994 playoffs. 2519 penalty minutes between three teams solidified Kocur’s reputation as a top enforcer. 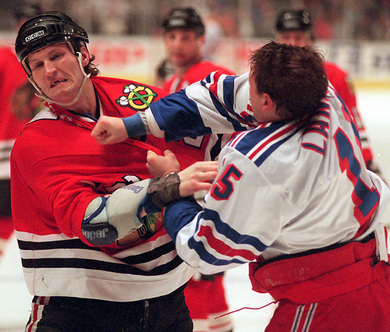 Kocur punches were known around the league to be so strong that bones were often broken time and time again in his opponents. He managed to have two stints with the Detroit Red Wings, winning two Stanley Cups before retiring. Today, Kocur is a very successful businessman outside of the hockey world setting up various foundations and events. His last hockey appearance saw him pay tribute to the great Bob Probert by wearing his number 24 during the 2014 Winter Classic Alumni game. 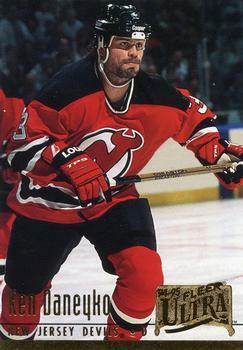 Daneyko spent his entire career with the New Jersey Devils and holds the franchise record for most games played in the red and black with 1283. Daneyko finished off a hockey season with over 200 penalty minutes an astonishing five times. A towering defenseman, Daneyko teamed up with Scott Stevens to form an insanely tough defensive pair that became feared around the league. You can hear him give colour commentary for Devils games after replacing Chico Resch of this year. This is great. I had no idea about any of these guys!